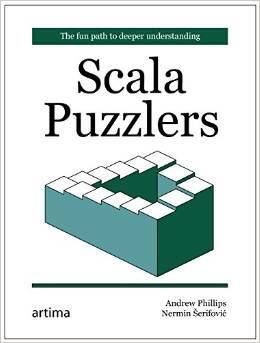 Welcome to Scala Puzzlers, the collection of Traps, Pitfalls and Corner Cases in the Scala language. Prepare to be surprised, entertained and...well, puzzled! What is presented here is a selection of seemingly simple examples which demonstrate that there's plenty of head-scratching left in Scala. Let your mind be challenged by unexpected and non-intuitive behaviour and results and learn something in the process. Choose a puzzler from the left-hand list to get started! Scala Puzzlers is a community effort! Have a puzzler you would like to share with the rest of the Scala community? Please follow these instructions to submit your puzzler. And don't worry, you will be properly credited for your contribution! Any kind of feedback is appreciated, about the website but also about the puzzlers themselves. If there is something you would like to let us know, please contact us.